The spectaclecase mussel historically inhabited the Mississippi River in Minnesota (Thiel 1981), yet recent collections in the state have come only from the main channel of the St. Croix River (Doolittle 1988; Heath and Rasmussen 1990; Havlik 1993). This species has very specific habitat requirements, occurring in colonies among boulders and under large rocks. Therefore, while it can be locally abundant, it appears to be only sparsely distributed within the St. Croix River. Doolittle (1988) found it alive at only two sites, Heath and Rasmussen (1990) found it alive at only four sites, and Havlik (1993) reported only older live specimens from a site near Wild River State Park. Given its limited distribution and specialized habitat needs, the spectaclecase was listed as a threatened species in Minnesota in 1996. It has been a candidate species for federal listing since 2004. The shell of the spectaclecase is elongate and compressed, with a concave ventral margin. It can be up to 23 cm (9 in.) long. 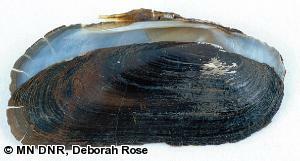 The outside of the shell is dark brown to black, and rayless. The pseudocardinal teeth are poorly developed, lateral teeth are absent, and the inside of the shell is white. The spectaclecase resembles the black sandshell (Liguma recta), but the black sandshell has well-developed pseudocardinal and lateral teeth, and the outside of the shell is often rayed. The spectaclecase has a very narrow range of habitat preferences. It inhabits large rivers with moderate to swift currents, such as the St. Croix, and appears to often colonize microhabitats that are sheltered from the main force of the current (Butler 2002). Within these microhabitats, the spectaclecase is often found among patches of boulders that are intermixed with mud, sand, and gravel substrates (Cummings and Mayer 1992; Parmalee and Bogan 1998). Mussels are primarily sedentary, but they can move around with the use of their "foot", which is a hatchet shaped muscle that can be extended out between the valves (shells). A mussel will burrow its foot into the sediment and then contract it to pull itself slowly along the bottom of its aquatic habitat (Sietman 2003). Mussels have a complex and distinctive reproductive cycle. Males release sperm into the water, which are drawn in by females through their incurrent siphon. Fertilized eggs are brooded in the female's gills, where they develop into tiny larvae called glochidia. The spectaclecase mussel is bradytictic, with females brooding their young long-term before they are released as glochidia. Once the glochidia are expelled from the female's gills, they attach to fish gills or fins by clamping onto them with their valves. The glochidia live as parasites on the host fish until they develop into juvenile mussels, at which point they detach from the fish and fall to the streambed as free-living mussels. Fish hosts for the glochidia of the spectaclecase are currently unknown (Parmalee and Bogan 1998). It has been speculated that this species may produce 2 broods of young per season (Howard 1915; Gordon and Smith 1990). Currently, the spectaclecase mussel is only known from eight sites along an 85-mile reach of the St. Croix River in Minnesota. The viability of these remaining populations is jeopardized by the introduction of non-native zebra mussels (Dreissena polymorpha) into the river. Zebra mussels can attach themselves in large numbers to the shells of native mussels, eventually causing death by suffocation. While the Spectaclecase has the potential to be locally abundant, the colonial nature of this species makes it especially vulnerable to zebra mussel infestation. Other threats to Spectaclecase mussels include habitat modification, non-point and point source water pollution, and siltation. If the effects of these factors cannot be mitigated, the spectaclecase mussel could be extirpated from Minnesota. A critical research need includes the identification of the primary larval fish host for this mussel species, which could aid in its conservation. A 10-year statewide mussel survey initiated by the Minnesota DNR in 1999 resulted in a better understanding of spectaclecase mussel's ecology and current status in Minnesota. Butler, R. S. 2002. Status assessment report for the spectaclecase, Cumberlandia monodonta, occurring in the Mississippi River system (U.S. Fish and Wildlife Service Regions 3, 4, 5, and 6). U.S. Fish and Wildlife Service, Asheville, N.C. 69 pp. Cummings, K. S., and C. A. Mayer. 1992. Field guide to freshwater mussels of the Midwest. Illinois Natural History Survey Manual No. 5. 194 pp. Gordon, M. E., and D. G. Smith. 1990. Autumnal reproduction in Cumberlandia monodonta (Unionoidea: Margaritiferidae). Transactions of the American Microscopical Society 109(4):407-411. Havlik, M. E. 1993. Unionids and margaritiferids (Mollusca: Bivalvia) in the Saint Croix River bordering Minnesota at Afton and Wild River State Parks, 8-17 June 1992. Final report submitted to the Nongame Wildlife Program, Minnesota Department of Natural Resources. 41 pp. Heath, D. J., and P. W. Rasmussen. 1990. Results of base-line sampling of freshwater mussel communities for long-term monitoring and the Saint Croix National Scenic Riverway, Minnesota and Wisconsin. Report submitted to the Wisconsin and Minnesota Department of Natural Resources. 45 pp. Howard, A. D. 1915. Some exceptional cases of breeding among the Unionidae. The Nautilus 29(1):4-11. Parmalee, P. W., and A. E. Bogan. 1998. The freshwater mussels of Tennessee. The University of Tennessee Press, Knoxville, Tennessee. 328 pp.